Ali Moore of Groundswell Greetings is co-hosting the August 2017 edition of Lady Boss at Chhaya Café in Philadelphia. Find ticket information here. A: Happy Hour at Bistrot La Minette. A: I listen to more music than podcasts! My favorite album is Frank by Amy Winehouse. A: DocuSign! I contract with TeamGG artists for every design and DocuSign helps me manage records without a hitch. A: UrbanStems! I look up to them as a thriving company with a similar disruptive model as GG but in the floral delivery business. A: "This is not normal." 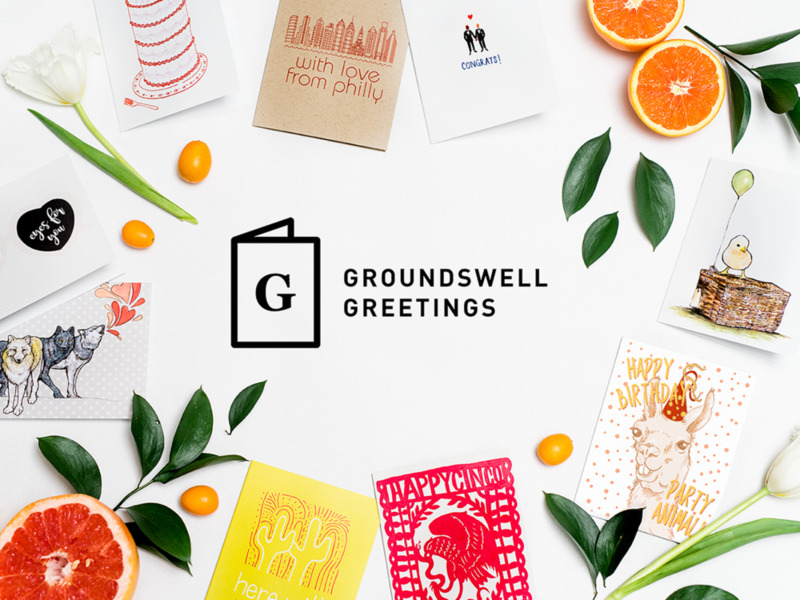 A: Launched in 2017, Groundswell Greetings sells artful, playful, and culturally relevant cards. Our mission is to provide a diverse base of customers with affordable, convenient, and meaningful alternatives to the often overstated and underwhelming cards found in typical card aisles. We are powered by a growing team of more than 30 local artists and illustrators, and take great pride in creating and printing cards in our hometown of Philadelphia, PA with 100% recycled paper. Committed to building a community in support of the arts and women in business, Groundswell Greetings always loves to hear how we can better serve your card-giving needs. A: In July we were chosen as Philly Mag's 2017 Best-of-Philly in the category of greeting cards! Our offering of more diverse card occasions (e.g. gay weddings, pet adoption, Ramadan, Diwali) for modern buyers seemed to really resonate with them. A: My favorite part of the day is recruiting and collaborating with TeamGG — the (mostly women!) collective of illustrators, graphic designers, and visual artists who invent our card designs. I love working with creative people and helping bring their talent to more people. I am motivated by the mission of helping our customers' communicate meaningfully by selling fresh, fun cards that are sustainably produced and convenient to browse and buy online. A: The sooner you get used to hearing "no," or more likely just no response, the better. We are raised to maximize conditions for hearing "yes," mitigate risk, and avoid rejection, but when you're trying to get strangers' attention in a super competitive industry, the tactics have to be more direct. Right now I'm my sales team, so I'm constantly cold emailing/calling/dropping by stores, press outlets, etc. Mostly I hear "no thanks" or nothing at all. Some days it's demoralizing, but over time it just has become a regular part of my day — as routine as balancing the books or updating social media. Like so many aspects of starting a business, it seems to be a numbers game (insert the "shots you don't take" sports adage here). Q: Why should others join us for Wellstruck Lady Boss? A: I immediately felt like I gained an encouraging group of ambitious women who want to help each other succeed. Whether sharing an accomplishment, recommending a vendor, or asking for help with a tricky interpersonal issue, I turn to Lady Boss for a judgment-free forum of smart, lovely ladies.